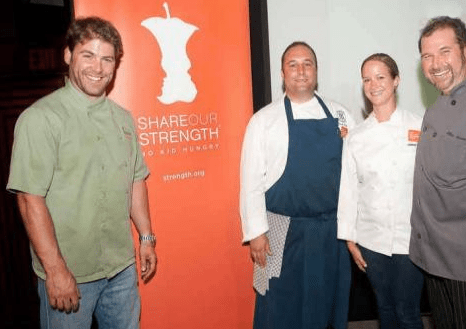 March 12, 2014 (West Palm Beach, FL) — Calling all foodies and philanthropists: Tickets are now on sale for Share Our Strength’s Taste of the Nation® Palm Beach, the city’s premier culinary benefit dedicated to ending childhood hunger. This year’s event will be held April 23, from 7:00 to 10:00 p.m., at the Kravis Center for the Performing Arts. The highly anticipated annual tasting event, which supports Share Our Strength’s No Kid Hungry® campaign to end childhood hunger in America, will feature Palm Beach’s top chefs, sommeliers and mixologists united for a cause: making sure all children in this nation have the healthy food they need, every day. More than 600 guests expected to attend will have the opportunity to brush shoulders with 100 of the city’s most influential in the food and drink scene and taste their signature fare and spirits. Culinary tastemakers leading the 2014 event include chairs Zach Bell (Addison Reserve Country Club), Clay Conley (buccan and Imoto), Lindsay Autry (Bravo’s Top Chefalum) and Allen Susser (Chef Allen’s). The No Kid Hungry campaign is ending childhood hunger in this nation by ensuring all children get the healthy food they need, every day by connecting them to nutrition programs like school breakfast and summer meals and by teaching families how to cook healthy, affordable meals at home. Since summer 2011, No Kid Hungry efforts to expand access to summer meals and school breakfast have helped connect kids to more than 34 million additional meals. The No Kid Hungry campaign is replicating that success around the country by working collaboratively with its partners to feed millions of American children. In 2013, Taste of the Nation Palm Beach raised more than $57,000, which can help connect children in need with up to 570,000 meals. One hundred percent of ticket proceeds from Taste of the Nation Palm Beach benefit the No Kid Hungry campaign, thanks to generous support from National Presenting Sponsor Sysco, National Sponsors American Express and Food Network, S.Pellegrino Natural Sparkling Water, and local sponsors Lincoln Motor Company, Nespresso, Whole Foods, Wine Watch, Brickhouse Public Relations, Mike Sipe Entertainment, Panache: a Classic Party Rentals Company, Elan Creative Communications, Clear Channel Media & Entertainment, and Palm Beach Illustrated. To date, confirmed restaurants in this year’s event include: Addison Reserve Country Club, The Backyard Bar at Palm Beach Hibiscus House, Bistro 1001, Brio Tuscan Grille, Buccan, Casa D’Angelo, Chops Lobster Bar/City Fish Market, Citrus Grillhouse, Dada Restaurant, Hollywood Cupcake, Jové Kitchen & Bar at Four Seasons Resort Palm Beach, PB Catch Seafood & Raw Bar, Pistache French Bistro, The Sugar Monkey, Talay Thai/Aah Loi Thai & Sushi, and Whole Foods Market. To purchase tickets for Taste of the Nation Palm Beach, visit www.ce.strength.org/palmbeach. My kids are literally counting down the days to Our Kid’s World on Saturday April 26th & Sunday April 27th in West Palm Beach. There will be lots of educational activities and the kids will meet their favorite TV characters… Thomas the Train, Dora The Explorer, Go Diego Go, Caillou, Curious George, Star Wars characters and lots more. What could be better than getting free kids tickets? This is definitely gonna be a great event for the entire family! Click on this link to access free kids tickets http://www.adayforkids.com/free-kids-ticket.cfm or visit their website http://www.adayforkids.com for more event details.